Come face-to-face with famous Americans in American History Alive: The New Century! Meet influential Americans who helped change the 20th century. Hear the spine-tingling civil rights speeches of Martin Luther King Jr. Find out the secrets to Amelia Earhart’s famous flights, and meet Louise Arner Boyd, a famous female explorer of the Arctic. These famous personalities along with Teddy Roosevelt, Alexander Graham Bell, Franklin D. Roosevelt, Rosie the Riveter, and Eleanor Roosevelt will appear at Compass this spring. This is the final quarter and of the American History Alive! series, so make a point to see these engaging portrayals! 4/4/18: Teddy Roosevelt as portrayed by Peyton Dixon of Kingston, NJ. Mr. Dixon discovered the world of first-person interpretation as an extension of his more than 25-years experience as an actor and performer combined with his passion for American History. 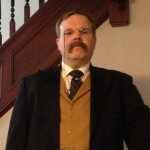 He has worked as a historical interpreter for 15 years and appeared venues such as Independence Hall in Philadelphia, Federal Hall in New York, and the National Archives in Washington, D.C. He has been featured on television with A&E’s biography and a PBS documentary and has performed in over 40 states. Mr. Dixon graduated from the DuPont Manual/Youth Performing Arts School of Louisville, Kentucky, and earned a Bachelor of Fine Arts in Theatre Performance from Otterbein College of Westerville, Ohio. As Roosevelt, Dixon reveals that beneath the “larger-than-life” image of glasses and scruffy mustache, the nation’s 26th president was confident, energetic, and passionate. Dixon will show how Roosevelt tirelessly worked to improve the lives of hard-working people and to promote conservation. Mr. Dixon last visited Compass as John Adams in October 2017. 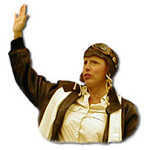 4/11/18: Amelia Earhart as portrayed by Mary Ann Jung of Annapolis, MD. Mary Ann will make her ninth appearance at Compass! She has appeared at the National Air and Space Museum as Amelia Earhart, and has won top honors from the Maryland State Arts Council. She performs most frequently in schools, libraries, and museums including the National Theatre of Washington, Smithsonian, the Folger Shakespeare Library, Port Discovery Children’s Museum, and the National Museum of Civil War Medicine. She has also appeared on CNN, the Today Show, and Good Morning America. 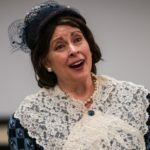 Mary Ann last visited Compass as Clara Barton in January 2018. 4/18/18: Louise Arner Boyd as portrayed by Kate Campbell Stevenson of Silver Spring, MD. Ms Stevenson is a writer, actor, and director who combines her more than 25 years of experience in music, theatre and education to bring to life her living history portrayals of famous American Women. Kate will introduce Compass to Louise Arner Boyd, a wealthy adventurer and activist turned explorer who led seven arctic expeditions in the early twentieth century. In her one-women programs, “Women: Back to the Future” and “Petticoats and Politics”, Kate has portrayed Abigail Adams, Bessie Coleman, Sacagawea, Lucy Stone, Rose Crabtree, Alice Paul, Eleanor Roosevelt, Marian Anderson, and Rachel Carson. Ms Stevenson has performed at the National Theatre, National Press Club, National Park Service, National Archives, and in dozens of schools, community colleges, libraries, museums, historical societies, and women’s history/heritage programs. Her career has included starring in Broadway musicals, regional theater, and radio/television commercials. She earned degrees from the Indiana University School of Music, Michigan State University, and Northwestern Illinois School of Music. Ms Campbell Stevenson last appeared at Compass as Eleanor Roosevelt in December 2015. 4/25/18: Alexander Graham Bell as portrayed by Bob Gleason of Philadelphia. Mr. Gleason has been an integral living history interpreter at Philadelphia’s American Historical Theatre since 1991. He began portraying founding fathers and prominent Americans through the Freedoms Foundation of Valley Forge in 1985. He is known for in-depth historical research and audience interaction in his historical portrayals. As Thomas Edison, Mr. Gleason completely engages the audience with details about the inventor’s life, inspirations and inventions, as well as the message of imagination, ingenuity, and hard work. Mr. Gleason’s historical portrayals have taken him to the White House Visitor’s Center, Ford’s Theatre, the National Archives, the Library of Congress, the Air and Space Museum of the Smithsonian Institution, Constitution Hall, the National Constitution Center, Independence Hall, and more. Bob has been especially popular at schools, museums, historic sites and libraries throughout the United States. He was trained in theater at West Chester University and further developed his stage and vocal presence as a member of the Army’s Special Services Chorus touring the US and Germany as a goodwill ambassador. 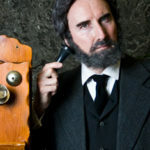 Bob last appeared at Compass in February 2018 as Thomas Edison. 5/9/18: Eleanor Roosevelt as portrayed by Kate Campbell Stevenson of Silver Spring, MD. Ms Stevenson is a writer, actor, and director who combines her more than 25 years of experience in music, theatre and education to bring to life her living history portrayals of famous American Women. 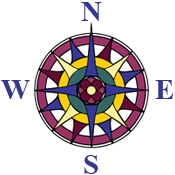 Kate will introduce Compass to Louise Arner Boyd, a wealthy adventurer and activist turned explorer who led seven arctic expeditions in the early twentieth century. In her one-women programs, “Women: Back to the Future” and “Petticoats and Politics”, Kate has portrayed Abigail Adams, Bessie Coleman, Sacagawea, Lucy Stone, Rose Crabtree, Alice Paul, Eleanor Roosevelt, Marian Anderson, and Rachel Carson. Ms Stevenson has performed at the National Theatre, National Press Club, National Park Service, National Archives, and in dozens of schools, community colleges, libraries, museums, historical societies, and women’s history/heritage programs. Her career has included starring in Broadway musicals, regional theater, and radio/television commercials. She earned degrees from the Indiana University School of Music, Michigan State University, and Northwestern Illinois School of Music. Ms Campbell Stevenson last appeared at Compass as Eleanor Roosevelt in December 2015. 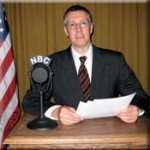 5/16/18: Franklin Delano Roosevelt as performed by Neill Hartley of Havertown, PA. Neill is professional actor, director, and educator with experience on national and regional television. His works regularly in industrial and voice over projects, and can be seen in the feature film, No Boundaries and in the PBS documentary, “Faith and the Founding Fathers.” Neill has appeared with many regional theater companies including the Arden, InterAct, and the Philadelphia Shakespeare Festival. He has directed at numerous theaters and currently served as the artistic director of Acting Without Boundaries, a theater company for young adults with physical disabilities. Neill is an assistant professor of voice and speech at The University of the Arts in Philadelphia. He holds an MFA in Acting from Temple University. Neill drew from his extensive theatre background to develop several one man shows depicting colorful characters in American History. He conducted extensive research to develop his “FDR: A New Deal For America” program which will give the audience a glimpse of fireside chats, an inaugural speech, and challenges in Roosevelt’s first administration. Neill last appeared at Compass in November 2015. 5/23/2018: Martin Luther King Jr. as portrayed by Bill Grimmette of Gambrills, Maryland. Bill will be making his sixth appearance at Compass after his popular performance as Frederick Douglass in December 2017. Bill Grimmette is a living history interpreter, storyteller, actor, and motivational speaker who has performed throughout the United States and abroad. He has appeared at the Smithsonian Institution and on National Public Radio. He has an M.A. in psychology from the Catholic University of America, and has done post-graduate work in education at George Mason University. Bill previously appeared as King for Compass in December 2015. 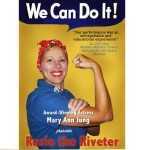 5/30/18: Rosie the Riveter as portrayed by Mary Ann Jung of Annapolis, MD. Compass students have not seen Rosie since December of 2015, but will welcome Mary Ann back as one of our favorite living history interpreters! She has appeared at the National Air and Space Museum as Amelia Earhart, and has won top honors from the Maryland State Arts Council. She performs most frequently in schools, libraries, and museums including the National Theatre of Washington, Smithsonian, the Folger Shakespeare Library, Port Discovery Children’s Museum, and the National Museum of Civil War Medicine. She has also appeared on CNN, the Today Show, and Good Morning America. What is American History Alive? 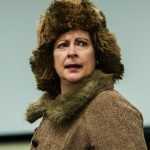 Each week a professional, costumed living history interpreter delivers a compelling first-person portrayal of his or her role in American history. Students connect faces, personalities, humor, and fun facts with key figures in history in these one-of-a-kind, weekly rendez-vous. Living history interpreters are the professionals employed by museums, historical sites, and conferences. Presentations are conversational in style, often involve the audience, and conclude with spontaneous audience Q & A. Watch the historical actors answer 21st century questions in character with period replies! This is a unique, experiential opportunity to introduce your kids to famous Americans and get them excited about American History. Many homeschool families have used American History Alive as inspiration for unit studies or biographical projects on the famous Americans introduced.